REIKI – Dr. Mikao Usui - Goddess T.O.U.C.H. Reiki, properly pronounced in Japanese as Lay-Key, is one of the offspring of Qigong with added Shontoist influence. Its focus is feminine (Spiritual/ Receptive) in nature and centers on the receptive influences of Spiritualism with the added benefit of Physical health. 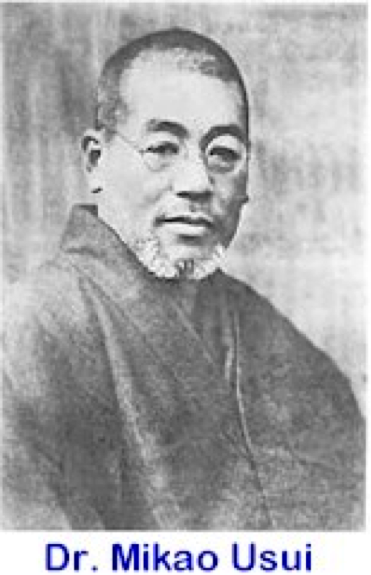 Reiki was re-discovered and revived at the end of the 19th Century by Mikaomi Usui of Kyoto, Japan. It was he who gave this Loving the energy the name Reiki. After Mikaomi’s business failed and left him in great debt, he desired to seek something other than material gain. He did a great deal of inner work through meditation near a waterfall on the Holy Mountain of Kuriyama. It was there that he decided to fast and meditate in solitude for 21 days. During this time, he received a “satori”, or sudden understanding in enlightenment. Dr. Usui is now buried in a Saihoji temple in the suburbs of Tokyo, with the story of his life written on his Memorial. It is said that he was honored by the Meiji Emperor of Japan. As Dr. Mikao Usui developed his Reiki practice and teaching methodology he determined that to achieve the correct (spiritual) path for humanity, specific principles should be followed. He utilized a poem from the Meiji Emperor as Reiki Ideals as a model to follow and to improve the spirit and make the body healthy. Dr. Mikao Usui incorporated many spiritually based poems into his teaching handbook. Each Reiki practitioner was taught to meditate on the Ideals each morning. 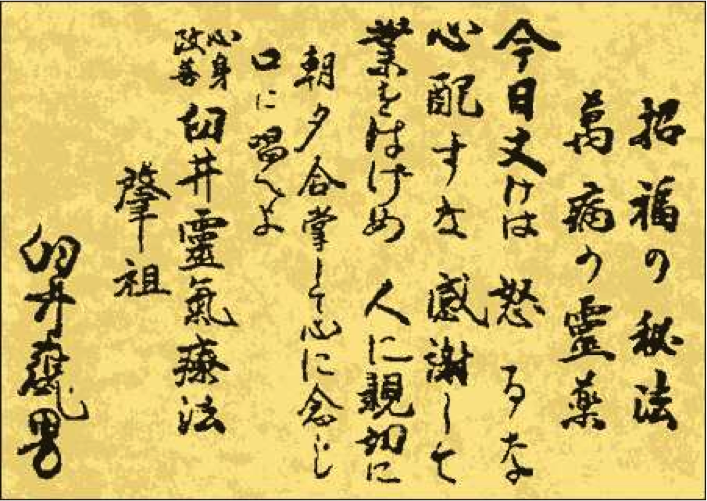 The following is the original Kanji and English translation of the Reiki Ideals from Dr. Mikao Usui.